Meta boxes are the movable boxes you see on the dashboard or when editing a post. 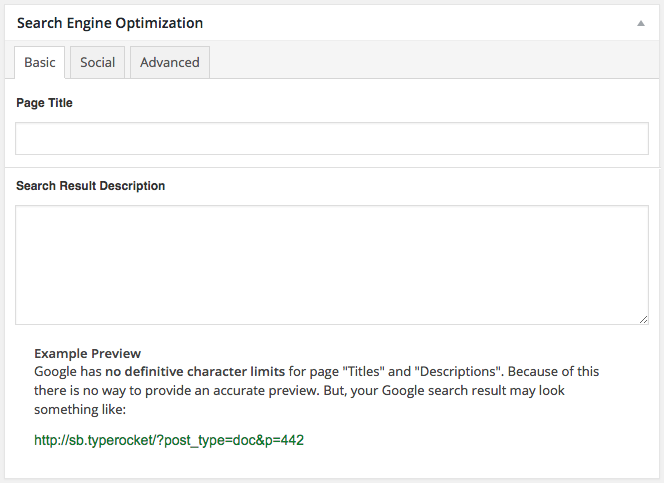 If you have the TypeRocket SEO plugin enabled you will see that it creates a meta box for you to add extra information about your content. To create a meta box with TypeRocket use the tr_meta_box() function. When you create a meta box be sure you are not using any of the names used by post type supports. To add a meta box to the dashboard use the addScreen() method on the newly created meta box. To add a meta box to a comment use addScreen() as well. To add a meta box to a post type you can use addScreen(), addPostType() or the apply() method. Pass in the post type's name/ID when you use add screen. Take a look at adding a meta box to both a custom post type created by TypeRocket and the WordPress posts post type. If you use apply() pass the TypeRocket post type object. Once you have added a meta box to a screen or post type you can start adding content to it. If you have debug mode turned on, TypeRocket will tell what function needs to be created for the meta box content. To add content to a meta box you can use the function debug mode gives you. You can also provide a callback. To specify a callback use the setCallback() method. If you want to set the label used by the meta box you need the method setLabel(). You can get the label with getLabel(). When instance a meta box TypeRocket automatically creates the ID for you. The ID is used to specify the name that WordPress associates with your meta box. It is also registered under the ID. When you register "Author Details" with TypeRocket the id is set to "author_details". There are five methods of dealing with arguments. Arguments the extra data you can use in the callback by accessing the meta box object passed into it. To set the meta box priority use the setPriority() method. You can also get the priority with getPriority(). There are four options for priority high, core, default or low. To set the context or the meta box use setContext(). You can get the context with getContext(). There are three options for the context normal, advanced, or side.